about five years ago. 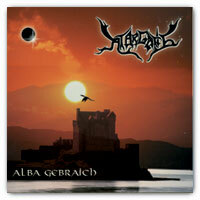 Back then I voluteered to design the CD Cover for ATARGATIS' debut MCD 'Alba Gebraich'. 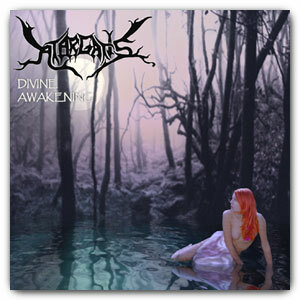 I did that for free, as I was out of the business of creating cd-covers for a living for some time by then, and because my connections to some of ATARGATIS' members predated even that time. The 'Alba Gebraich' artwork and booklet was a fun project, taking up about 3 days all things told. One of which was spent with the band sitting behind me while I was going wild in Photoshop. All artwork was created on that day, only for the text-layout for the booklet etc. did I work on my own. The band was more than delighted, and I had a real problem on my hands. As nice and fitting the image might be, I was not sure if using this image might get me into legal difficulties... I had never planned on using this exact image anyways. It is such a strong motive in itself that it would always be instantly recognizeable, regardless how much O could try to alter it. But like always if a first draft 'hits the mark', it becomes difficult changing it too far. A inital concept created with Poser & Bryce took me almost two nights to complete - and failed miserably to inspire the band. The mood was all wrong - which could have been changed - and also the definite CGI touch went down quite the wrong way. Although I still think it is a nice Bryce render, I had to agree with the band that it wouldn't work. I gave up after a few further tries I will not be showing the world, and let it rest. Going for the photorealistic but still completly generated dark forest I went and wasted another really long night creating a buch of trees in Bryce. Always trying really hard for a natural look, tweaking each and every tree untill it looked just right. But somehow I already knew what the result would be. The design flopped, totally. To arteficial, wrong color, they didn't like it one bit. I told myself after I had recovered from my disapointment. Being totally honest I had to admit this draft might the best one since the first, but it simply didn't have the power of that first one. But I wanted to go even beyond the simple raw pwer of the first draft - as a draft it was and had some flaws that would simply not look good being printed. So I tool that concept as a starting point and recreated it piece by piece, this time using all the Bryce and Photoshop tricks in my basket. A quick render was done using the original forest picture from the beginning as a backdrop, but this time partially transparent so that the sun/sky would shine through. The basic Bryce scene being so simple I was able to spend far more time on getting the lighting/mood right. All I need to do now was 'finalize' the draft... Hah. That was about 80% of the work still before me. lie between the final draft and the version you see to the right. Most of that time was spent on cosmetics for the water goddess, subtle facial changes, hair etc. Some more time was spent tweaking the overall composition, type etc.